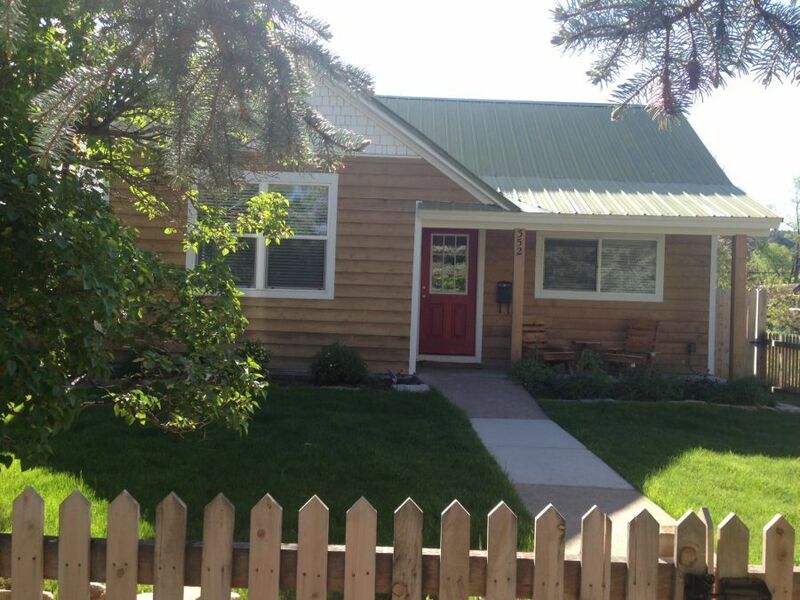 Hip, comfortable house just a few minute walk to downtown Durango. This house has an open plan design, cozy living and dining area, great furniture, free wifi, and has a large fenced front and back yard. Charcoal BBQ in the large back yard. This home is pet friendly with prior approval. The kitchen is designed for space and luxury for the gourmet chef and amateur cook alike. The master bedroom has a queen sized bed and the second bedroom also has a queen. The third bedroom has a twin-sized day bed with a trundle. Close to all the yummy Durango restaurants, coffee shops, and unique Main Street shops that make our town so special. toilet, shower, Double sinks, washer and dryer are located in bathroom. 42" Flatscreen and 40"Flatscreen with Direct TV. Denon Stereo for surround sound or MP3. All the essentials were there. The house was spotless and welcoming. The location was prime for getting downtown. Thanks for staying with us and glad the home was perfect in every way. We'd love to have you back. We rented for a week for our stay in Durango to go skiing at Purgatory. Convenient to town. I would not recommend for anyone that has dog allergies. My son has dog allergies, and we found dog hair in multiple places and he was miserable the entire stay. Other than that, it was a good rental. Glad that you liked the home and it's great location. This home is advertised as a pet friendly property and although every effort is taken to thoroughly clean, sometimes pet hair/dander will stick around. I'm sorry that your son had a difficult time with allergies. We have never had a problem from any guest in the past regarding pet hair. We wish that you would have brought this to our attention during your stay and given us a chance to move you to another location. We would love to have you return to Durango and stay in one of our many beautiful pet-free properties. It was a geat House. We had a great time it was Clean and close to town. I'm glad that when we spoke with you today about your stay, you assured us that everything was great about the property. We'd love to have you back again. Great little place! We loved the location. There were just two of us but the other full size bedroom also had a queen bed. The furnishings were modern and attractive. The place was real clean when we arrived. We got frustrated with the whole Hulu set up, but once we figured it out we ended up watching some TV. We missed having daily news channels however. We're in our sixties, so we still like news from papers and TV. Yard worked out great for our little dog. Both front and back were fenced in. We didn't have any problems with neighbors and noise. The house is an easy walk to down town, there are trails for walking and riding bikes within blocks and the river trail is easy access. Our group had a great stay here. It was close to the downtown area to access everything that was needed. Will definitely stay here again. Thank you for your review, and we are pleased that you enjoyed your stay. It's nice to be within walking distance to everything downtown. Hope to have you back again soon! This house is a wonderful place to stay in Durango. It is clean, close to downtown, and very comfortable. Would definitely stay here again!! Thank you for your review. This property is the perfect Downtown Durango retreat. It is well appointed, super cozy, walking distance to town and trails, and the fully fenced yard gives you plenty of privacy too. It is definitely a staff favorite. We hope to have you back again soon.